In my last post, I described my general love of all things eggplant and gave a recipe for a Chinese way of cooking them. In my litany of international ways with eggplant with which I am not only familiar but also adore, I left out one very important subcontinent: India. That’s because I wanted to write a post specifically about Indian ways with eggplant, also known as brinjal. In India, eggplant can be stuffed and baked, stuffed and simmered, fried, roasted and mashed, and, of course, cooked into a myriad of curries, from the dry to the saucy, with sauces based on tomatoes, onions, coconut milk, ground up nuts or yogurt. I believe the creative culinarians of India have simply come up with more ways to cook eggplant than just about anyone else in the world. Well, maybe that’s a little bit of an exaggeration–but I don’t much care, because the simple truth is this–every Indian eggplant recipe I’ve tried, I’ve adored. There isn’t a single one I’ve tried that I’ve not liked. Not one. In my experience, each one is tastier than the last, or at least as tasty as the last and they are all just SO amazing. It’s because eggplant is a flavor sponge that Indian spices just make them taste so amazing. What is really amazing is how well the eggplants soak up the spices without losing their own sweet or lightly bitter flavor. And, as always, eggplant has that rich, silky texture that makes it especially filling and satisfying without being heavy. 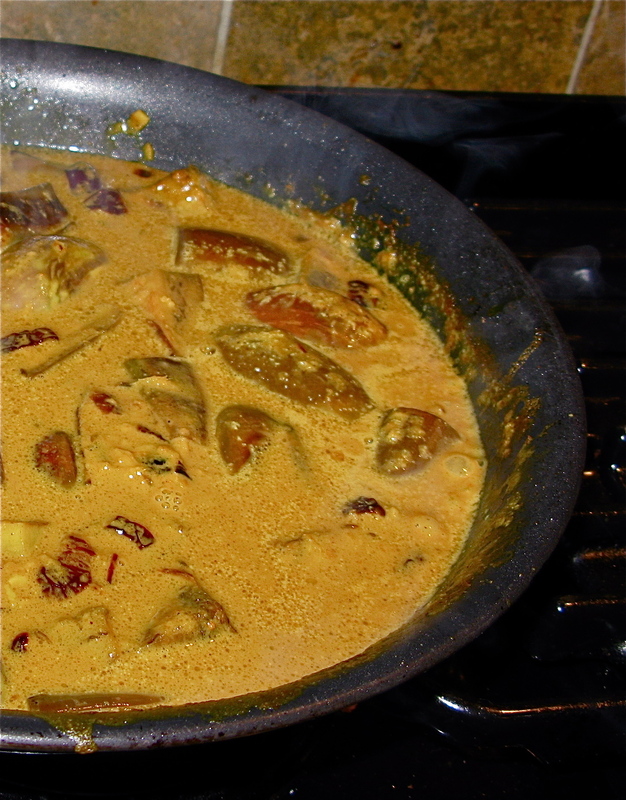 This particular recipe is a traditional Hyderabadi way of cooking tiny baby eggplants–like the ones I picked from the plants on my deck. I tasted this dish just this week, on Tuesday, at Reethika’s lunch buffet. Cute whole baby eggplants were split into quarters without being cut completely apart and simmered in a rich, warm brown curry sauce redolent with spices in the foreground, and deep in the background was an addictive nutty sweetness redolent of well, it tasted sort of like peanuts, but not exactly. I thought it might have been peanuts mixed with toasted round urad dal or perhaps chana dalia, but I couldn’t be sure. When I got home and started researching the recipe, I discovered that I was right about the peanuts, but the other nut flavor I caught was toasted sesame seeds. AHA! That’s why it didn’t taste exactly peanut like–but had another nut flavor mixed in as well. The other main flavoring was ground toasted unsweetened coconut. Knowing I had plenty of baby eggplants to be used this weekend, I decided to try my hand at this delicious, unique curry. Of course, by the time I started cooking dinner on Saturday, I realized that some very important ingredients I usually had in my pantry were missing. But, more on that later. 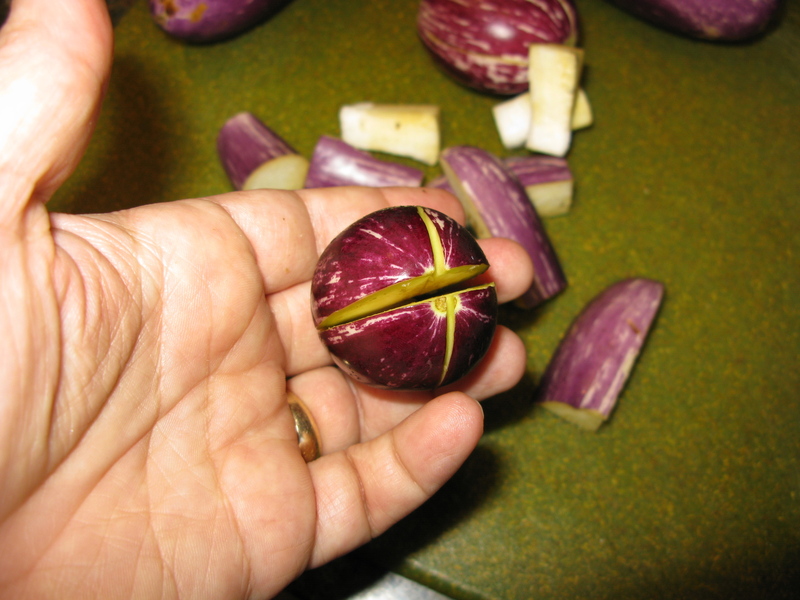 When I picked my baby eggplants–some of them turned out to be too big to be really counted as babies. So, instead of just slitting the eggplants into quarters, I actually cut them into chunks. These I browned in peanut oil until they were just starting to soften and were maybe about half-cooked through. I set the eggplant aside, and browned a red onion cut into a medium dice in the same pan. Back to those important ingredients that turned up missing. I almost always have dry roasted unsalted peanuts in my pantry, as well as white sesame seeds and unsweetened shredded coconut. However, once I picked my eggplants and had a severe craving for this peanut-sesame sauce, I discovered that Zak had eaten the peanuts, the sesame seeds had been borrowed by Morganna and the coconut had fallen into a hole in the space-time continuum and had ended up in another universe entirely. 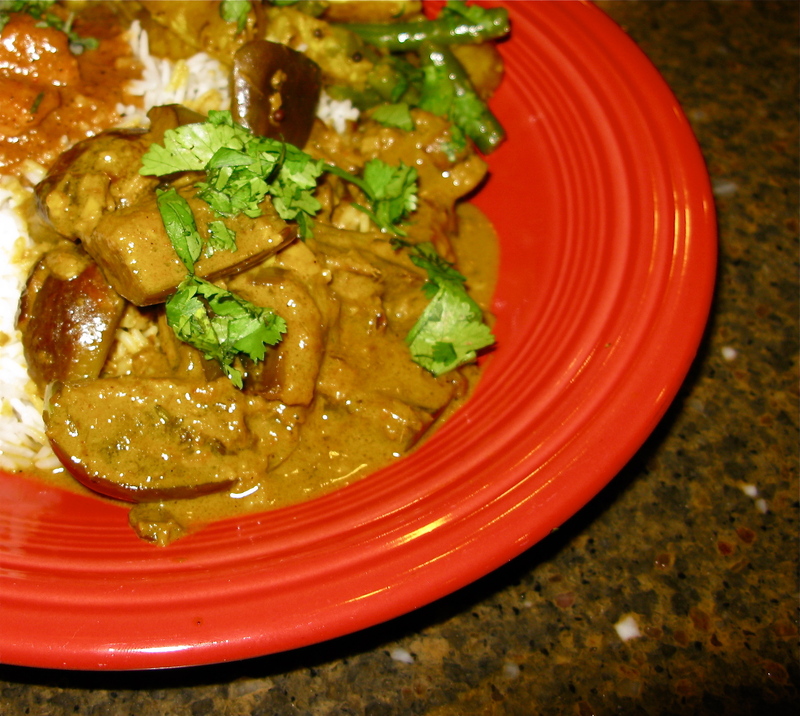 Normal people would just make a different eggplant curry, but not I. My tastebuds were set for the peanut sauce and the peanut sauce I would have. I thought of going out the Asian market to pick up the peanuts, sesame seeds and coconut, but by the time I was cooking, the store was already closed. So, I set to thinking. While I lacked peanuts, I did have natural peanut butter, which is nothing more than peanuts ground up with a little bit of extra peanut oil and a touch of salt. And though my pantry was sans sesame seeds, I did have a jar of tahini, which is nothing more than ground up toasted sesame seeds. And though there was no coconut, I did have some coconut milk, which while it isn’t made from ground up coconut directly–it is made of ground coconut steeped in hot water until the flavor and fat is extracted. I made the command decision to use these substitutions, to see if I could make a credible alternative to the traditional recipe. I have to say that while I felt guilty for bastardizing the recipe, and I fully intend to make a more traditional version of it the next time I get my hands on baby eggplant, eating the dish cooked this way was fully as satisfying as eating it made the proper way. The only difference I could detect was that my version was a little smoother, and the sauce was a bit more rich, I think from using the coconut milk instead of ground coconut. Other than that, even with the substitutions, mine was a credible version of a classic dish that is going to become a regular way to cook eggplant in my kitchen, and is worth knowing, especially for folks who don’t own a grinder that is up to the task of grinding peanuts, sesame seeds and coconut into a smooth paste. Heat the peanut oil in a shallow, heavy bottomed pan over high heat and cook the eggplants until they are soft, but still somewhat firm in the middle–not quite completely tender. Remove eggplant and set aside. 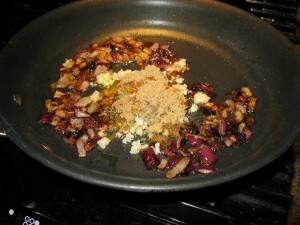 In the same pan, using the same oil, brown the onion, stirring, until it is a deep mahogany color. Add the ginger and garlic, then the peanut butter, tahini and coconut milk, and turn the heat down to medium and cook, stirring, until fragrant–about two minutes. Add the spices, and cook one more minute. Add the tamarind concentrate and water, and stir well to combine. Simmer until the eggplants are fully tender and the sauce has thickened, adding water as needed to cook the eggplants all the way. Add salt to taste, and sprinkle with cilantro as garnish. This is great with chapati or rice, either one. It’s even better with both. This looks yummy! A similar eggplant curry, with green chillies and a peanut base, is used as an accompaniment to Hyderabadi biryani. And since eggplants are one of my favorites, I am going to tell you about 3 of my favorite ways to cook eggplants. 1. Slice them into thin strips and coat them in a batter of beaten eggs, along with salt, a pinch of turmeric and a dash of chilli powder and shallow fry them on the tava. 2. Stuff baby eggplants using a fresh coriander leaves+ shallots+ green chillies paste and then cook them in a kadai. 3. Is what we call ‘Yennai/ ennai kathirikkai’ – a generic name used to indicate a number of eggplant dishes. In my family, it is used to refer to an oil rich brinjal curry, cooked using reduced tamaring pulp and black sesame seeds, along with pepper. This is usually served as an accompaniment to Biryani (whose cooking method is diff from that of the Hyderabadi biryani). I should stop now and get back to work, but when I get home, I am mailing you the recipe to the last one – I would love for you to try it. I hope you are ok. We have not heard from you for so long. We miss you! I hope you’re alright. Please do let us know if you’re doing ok or need help. We miss you! I was looking for a way to cook eggplants with a delicious recipe. This looks really delicious. Thank you for the post. I keep checking back here to see if you’ve written. I hope you are doing well – wishing nothing but the best for you. I hope that you are ok. I was so excited to see you were back and now we haven’t heard from you in ages. I really miss your stellar posts and truly hope all is well with you. I keep checking but no Barbara. Are you ever coming back? Please say something! It’s not fair and everyone is so worried. Even just say “Hi, I’m ok.” would be reassuring and calm us down. Please?